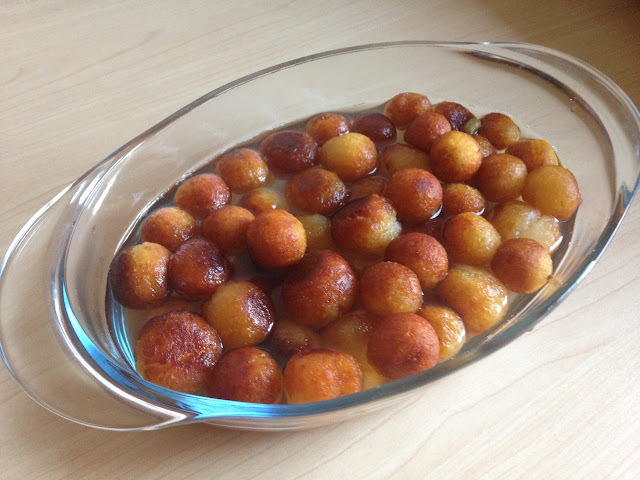 After so many failures i finally discovered a way of making "gits gulab jamun" just right . 1.Take warm water in a cup . 3.Take a flat dish and take little water just enough to make one round gulab jamun . 4.Making one gulab jamun with little water at a time makes sure that jamun is moist and not cracked and dried . 5. Cover it with damp cloth to keep it moist untill you fry them . 1. In a deep frying pan let oil be hot enough to let jamun come from bottom to up slowly . 2. Oil should not be too hot , else jamun will get burn from outside and will not cooked from outside. 3. The heat should be between medium low and high in intervals. 4. Watch for jamun getting bigger in size . 5. If they dont rise it means water is not enough and they will.turn hard . 1. Grind 1 cup sugar with four small cardomoms. 2. Take 2 cups of water and one cup of sugar . Boil for a 2 minutes . 3. In a warm sugar syrup soak your jamuns . 4. Refrigerate and enjoy . I ate this a couple of times over at your house and i loved it.